Skirted by soft sandy beaches and marram grass-topped dunes, not even the intrusion of the road to Studland and the queue of traffic waiting for the Sandbanks chain ferry can spoil the serenity of South Haven Point. Seen through modern eyes it is an obvious spot for a place of refreshment – a function fulfilled by the acclaimed Shell Bay Seafood Restaurant & Bistro where diners on the waterside terrace contemplate a panorama of views from Brownsea Island to the Purbeck Hills that only improves as daylight fades. Historically though such a consideration was purely incidental. The famous Poole Logboat in the town’s museum is evidence that mankind has been making journeys within the harbour since the Iron Age. Such craft would not only have linked the many farms along its shores to markets at Poole and Wareham, but also provided outlets for Purbeck’s clay mining industry and, to a lesser extent, stone quarries. By the 18th and 19th centuries ‘passage’ boats were running regular services between Poole and Wareham with stops at South Haven, Ower, Wytch and Gold Point at the mouth of the River Frome each served by a passage house – a simple inn offering food and drink, accommodation and stabling. The Haven Inn stood roughly where the modern Shell Bay restaurant is on land owned by the Bankes Estate. In the 1841 census it was run by a John Gotobed and a decade later by Charles Wheeler, but within thirty years it had closed, doubtless made redundant by the spread of the road network and the railway beyond. 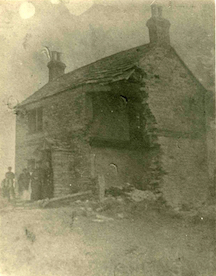 A cottage attached to the inn was still in use though and by the 1880s the tenant John Dean was writing to the estate to secure a lease on Wadmore Farm in Studland as his home had fallen into disrepair. ‘Wadmore Farm had to be rebuilt following a fire and it took five years but eventually the Bankes Estate spent £80 to bring it back and John and his wife Ann Marie Summers moved there,’ says Joyce Meates, secretary of Studland History Group and John Dean’s great- great- grand-daughter. The twentieth century brought with it ever-greater numbers of leisure visitors to Purbeck and many found their way to the peninsula with its refuge for pleasure craft harbourside and safe swimming off the seaward Shell Bay. To cater for them, Baker’s Café offered teas and lunches in a wooden cabin that by August 1932 was also inviting fishing and picnic parties according to its advertisement in the Hants & Dorset bus timetable. Competition for Baker’s was provided by a Great War veteran from Poole by the name of Jack Lovell who, having rowed out to Shell Bay with his sisters one fine day in 1923, bought a tea-making business and tent from a Miss Barnes. In an interview with the Poole Heraldin 1969 the 77-year-old Jack said he began trading with ‘half a crown and a table’. Providentially, the summer of 1923 also saw the Bournemouth-Swanage Motor Road and Ferry Company come into being following an Act of Parliament permitting slipways to be built and a new road to Studland. The first (steam-driven) Sandbanks ferry began service on 15 July 1926, bringing with it even more visitors that Lovell’s aimed to entice with the words ‘disabled ex-serviceman’ painted by the entrance. Jack, whose father was the last of the toll collectors from when travellers had to pay to come into Poole, was the youngest of 17 children. In 1914 he had signed on to sail around the world as a paid hand aboard the yacht Dorade, but on the outbreak of war answered Kitchener’s call and joined the Dorsetshire Regiment. He lost a leg at Gallipoli, was discharged and returned to Purbeck View, the family home in East Street that his father – who had lost an arm at age of 12 in an accident at the Brownsea pottery – had built for £90. 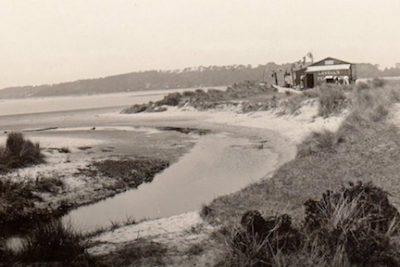 The first Lovell’s café was on the Shell Bay side, housed in an old army hut Jack bought from outside Wareham station and had transported to the beach by boat. In time he moved to the harbour side, presumably acquiring a tenancy on the site and replacing Baker’s. Three years after opening the café, Jack married Mary Jane Martin and set up home in Stanley Road, near Baiter, with Jack working in a coal yard during winter. 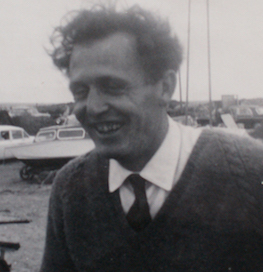 He cycled to Poole Quay each day during the season, his stump in a metal milk can screwed to the pedal, then row to work in a boat called ‘DorJohn’ after his children Dorothy and John. He brought with him fresh water, a practice continued by John until the mid-1960s when mains supply reached Studland and water was piped to the café. Gill’s childhood memories of life around the café recall an age when that small corner of Purbeck was a hardier place than it is today. There used to be a large grassy area in front of the café where children would play and Gill remembers a host of yellow lupins. ‘We also looked after the houseboats that were a little further along and we had 50 moorings as well – dad had me on the winch on many occasions. I went to work there full time in 1974, did one season in the old wooden café then he built the brick café in 1975 and opened for the first season in the hot summer of 1976. I was there until 1982. John Lovell as many remember him – in the boat yard at Shell Bay enjoying a laugh about something. ‘We didn’t have a formal lease on the land there until dad built the brick café in 1975 – for more than fifty years it had all been done on a handshake with the Bankes Estate,’ says Gill Blackham. In 1988 John gave up his lease on the land, which had been part of the Bankes bequest to the National Trust. The Trust also bought the buildings, but John was not blessed with a long retirement and died in 1991 at the age of just 61. Michael Hipwell then ran the café and shop before selling up around the turn of the century to Peter Farrar and Neil Girkins who established it as a fish restaurant. In 2015 Neil sold his interest to Peter’s chef son Jamie who with his wife Cass now strives to maintain its reputation as one of Britain’s best seaside restaurants – not bad for a café started ninety-five years ago with ‘half a crown and a table’. • Jack Lovell’s great-nephew Peter is researching the family history and would welcome stories about Shell Bay Café by email at ptlovell0@gmail.com.